An organic light emitting device is provided having an emissive layer with an internal interface. The concentration of a second phosphorescent material in a second organic layer is different from the concentration of a first phosphorescent material in a first organic layer, creating the interface. The materials in the first and second organic layers may be the same or different. In addition to this interface within the emissive layer, the device has one or more features designed to mitigate failure mechanisms which may be associated with electrons or excitons passing from the cathode through the emissive layer to damage organic layers on the anode side of the emissive layer. In addition, devices are provided having an interface within the emissive layer as described above, and a lower energy emissive material on at least one side of the interface. This application claims priority to U.S. Provisional Application No. 60/877,696, filed on Dec. 28, 2006, and U.S. Provisional Application No. 60/900,624, filed on Feb. 8, 2007, which are incorporated by reference in their entireties. The present invention relates to organic light emitting devices (OLEDs). More specifically, the present invention relates to OLEDs having particular structures that may enhance lifetime. A ligand is referred to as “photoactive” when it is believed that the ligand contributes to the photoactive properties of an emissive material. A first energy level (HOMO or LUMO) is considered “less than” or “lower” than a second energy level if it is lower on a conventional energy level diagram, which means that the first energy level would have a value that is more negative than the second energy level. A first energy level (HOMO or LUMO) is considered “higher” than a second energy level if it is higher on a conventional energy level diagram, which means that the first energy level would have a value that is less negative than the second energy level. For example, the HOMO of CBP −5.32 eV and the HOMO of TPBI is −5.70 eV, therefore the HOMO of CBP is 0.38 eV “higher” than the HOMO of TPBI. Similarly, the LUMO of mCP is −0.77 eV and the LUMO of CBP is −1.23 eV, therefore the LUMO of mCP is 0.46 eV “higher” than the LUMO of CBP. The above values were determined using density functional calculations performed using the Spartan 02 software package, available from Wavefunction Inc. of Irvine, Calif., at the B3LYP/6-31G* level. 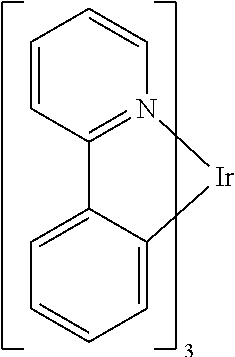 A pseudo potential option can be used for species containing heavy metals such as Ir(ppy)3. Density functional calculations have been demonstrated in the literature to be able to qualitatively predict energies of organic and inorganic compounds. As used herein, the term “consisting essentially of” one or more materials as applied to a layer in an organic light emitting device means that there may be materials present in addition to those listed, but any such additional materials are present only in minor quantities (such as impurities) and do not significantly affect the electronic properties or emissive of the device, i.e., they do not significantly contribute to the transport or trapping of holes or electrons, they do not result in a shift of the recombination location, and they do not significantly contribute to or participate in exciton decay, emissive or otherwise. Unless otherwise indicated, percentages of organic compounds in various layers described herein are weight percentages. The following two references including Samuel as a co-author describe solution processable phosphorescent OLEDs with doped emissive layer in direct contact with ITO. E. E. Namdas, T. D. Anthopoulos, I. D. W. Samuel, Applied physics letters 86, 161104 (2005). T. D. Anthopoulos, M. J. Frampton, E. B. Namdas, P. L. Burn, I. D. W. Samuel, Adv. Mater. 2004, 16, No. 6, March 18, pp. 557-560. In a first aspect, an organic light emitting device with an interface in the emissive layer is provided. The device has an anode, a cathode, and an emissive layer disposed between the anode and the cathode. The emissive layer includes a first organic layer, which includes a first phosphorescent material and a first non-emissive material. The concentration of the first phosphorescent material in the first organic layer is 10-90 wt %, and the concentration of the first non-emissive material in the first organic layer is 10-90 wt %. The emissive layer also includes a second organic layer which includes a second phosphorescent material and a second non-emissive material. The concentration of the second phosphorescent material in the second layer is 3-25 wt %, and the concentration of the second non-emissive material in the second organic layer is 75-97 wt %. The concentration of the second phosphorescent material in the second organic layer is lower than the concentration of the first phosphorescent material in the first organic layer, preferably at least 5 wt % lower, and more preferably at least 10 wt % lower. The first non-emissive material and the second non-emissive material may be the same material or different materials, and the first phosphorescent material and the second phosphorescent material may be the same material or different materials. Thus, there are four combinations: (1) same phosphorescent material in both first and second organic layers, and same non-emissive material in both first and second organic layers; (2) different phosphorescent material in the first and second organic layers, and same non-emissive material in both first and second organic layers; (3) same phosphorescent material in both first and second organic layers, and different non-emissive material in first and second organic layers; and (4) different phosphorescent material in the first and second organic layers, and different non-emissive material in the first and second organic layers. There are advantages to each combination. The first organic layer may consist essentially of the first phosphorescent material and the first non-emissive material, and the second organic layer may consist essentially of the first phosphorescent material and the first non-emissive material of the first organic layer. Device architectures that mitigate damage in the device and extend device lifetime are also provided for use with the first aspect, either individually or in combination. The first organic layer, the second organic layer, or both, may optionally further include a lower energy emissive material, wherein the concentration of the lower energy emissive material is 0.1-12 wt %. In a second aspect, one architecture to mitigate damage is provided. All organic layers between the first organic layer and the anode have a hole mobility and an electron mobility such that the hole mobility is at least twice as great as the electron mobility, preferably at least ten times greater, and more preferably at least 100 times greater. In a third aspect, another architecture to mitigate damage is provided. All organic layers between the first organic layer and the anode do not include any materials containing a group selected from the group consisting of triarylamine, napthyl, tri(N-carbazoyl)triphenylamine, tetraarylamine and carbazole. In a fourth aspect, another architecture to mitigate damage is provided. There are no organic layers between the first organic layer and the anode. In a fifth aspect, another architecture to mitigate damage is provided. A third organic layer is provided, disposed between the first organic layer and the anode. The third organic layer consists essentially of the first phosphorescent material. The third organic layer is in direct contact with the first organic layer and the anode, such that it is the only layer between the first organic layer and the anode. In a sixth aspect, another architecture to mitigate damage is provided. The device includes no more than three different organic materials, minimizing the number of materials subject to damage. In a seventh aspect, another architecture to mitigate damage is provided. The device includes no more than four different organic materials, where one of the organic materials is an electron transport material present in the device only between the emissive layer and the cathode. The limitation on the number of materials minimizes the number of materials subject to damage. In an eighth aspect, another architecture to mitigate damage is provided. All organic layers between the first organic layer and the anode consist essentially of organometallic materials. In a ninth aspect, another architecture to mitigate damage is provided. All organic layers between the first organic layer and the anode have a hole conductivity sufficiently large such that an additional 10 nm thickness in the layer results in a voltage rise of 0.1 V or less at a current of 10 mA/cm2. In a tenth aspect, another architecture to mitigate damage is provided. The first non-emissive material has a triplet energy of 2.7 eV or greater. In an eleventh aspect, a lower energy emissive material is provided that may be used with the first aspect, with or without the various damage mitigation architectures. The lower energy emissive material may be a fluorescent emissive material, a phosphorescent material, or a combination of the two where there are multiple lower energy emissive materials. The concentration of the lower energy emissive material may be 0.1-12 wt %, and a lower energy emissive material may be present in only the first organic layer, only the second organic layer, or in both layers. An organic layer including a lower energy emissive material may consist essentially of a phosphorescent material, a non-emissive material, and a lower energy emissive material. In a twelfth aspect, a device similar to that of the first aspect is provided, but where the wherein the concentration of the phosphorescent material in the second organic layer is higher than the concentration of the phosphorescent material in the first organic layer, as opposed to lower. The concentration of the first phosphorescent material in the first organic layer is 3-25 wt %, and the concentration of the first non-emissive material in the first organic layer is 75-97 wt %. The concentration of the phosphorescent material in the second layer is 10-90 wt %, and the concentration of the non-emissive material in the second organic layer is 10-90 wt %. Various other aspects as described above may be used in conjunction with the twelfth aspect. In various aspects, the first organic layer may consist essentially of the first phosphorescent material and the first non-emissive material, and the second organic layer may consist essentially of the second phosphorescent material and the second non-emissive material of the first organic layer. In various aspects, the total thickness of the first and second organic layers is preferably at least 400 Å. The thickness of the first organic layer is preferably at least 50 Å and the thickness of the second organic layer is preferably at least 50 Å. In various aspects, the first phosphorescent material preferably has a highest occupied molecular orbital that is at least 0.3 eV higher than the highest occupied molecular orbital of the first non-emissive material, and the second phosphorescent material preferably has a highest occupied molecular orbital that is at least 0.3 eV higher than the second occupied molecular orbital of the first non-emissive material. In various aspects, a fourth organic layer may be provided disposed between the second organic layer and the cathode. The fourth organic layer consists essentially of the second non-emissive material, and is in direct contact with the second organic layer. In various aspects, a fourth organic layer may be provided disposed between the second organic layer and the cathode. The fourth organic layer consists essentially of materials having a triplet energy at least 0.1 eV greater than the triplet energy of the second phosphorescent material, and the fourth organic layer is in direct contact with the second organic layer. In various aspects, the first non-emissive material may be selected from materials containing a group selected from the group consisting of triphenylene, carbazole, dibenzothiophene and dibenzothiophene coupled with carbazole. In various aspects, the first organic layer may be in direct contact with the second organic layer. FIG. 3 shows an organic light emitting device having first and second organic layers with different concentrations of phosphorescent material and non-emissive materials, and organic layers between the first organic layer and the anode with specific charge carrier mobility characteristics. FIG. 4 shows an organic light emitting device having first and second organic layers with different concentrations of phosphorescent material and non-emissive materials, and no organic layers between the first organic layer and the anode. FIG. 5 shows an organic light emitting device having only three organic materials. FIG. 6 shows an organic light emitting device similar to that of FIG. 3, but including multiple phosphorescent materials. FIG. 7 shows an organic light emitting device having first and second organic layers with different concentrations of phosphorescent material and non-emissive materials, and organic layers between the first organic layer and the cathode with specific charge carrier mobility characteristics. FIG. 8 shows a general phosphorescent OLED structure. FIG. 9 shows a specific organic light emitting device that was fabricated and tested, having first and second organic layers with different concentrations of phosphorescent material and non-emissive materials. FIG. 10 shows a specific organic light emitting device that was fabricated and tested. FIG. 11 shows a plot of current density versus voltage for the device of FIG. 10. FIG. 12 shows a plot of external quantum efficiency (EQE) versus current density for the device of FIG. 10. FIG. 13 shows a plot of normalized intensity (arbitrary units) versus time for the device of FIG. 10. FIG. 14 shows a plot of normalized electroluminescent intensity versus wavelength for the device of FIG. 10. FIG. 15 shows a specific organic light emitting device that was fabricated and tested. FIG. 16 shows a plot of current density versus voltage for the device of FIG. 15. FIG. 17 shows a plot of external quantum efficiency (EQE) versus current density for the device of FIG. 15. FIG. 18 shows a plot of normalized intensity (arbitrary units) versus time for the device of FIG. 15. FIG. 19 shows a plot of normalized electroluminescent intensity versus wavelength for the device of FIG. 15. FIG. 20 shows plots of normalized luminescence versus time for various device structures. FIG. 21 shows an organic light emitting device that was fabricated using the parameters in Table 2, having first and second organic layers with different concentrations of phosphorescent material and non-emissive materials. FIG. 22 shows an organic light emitting device that was fabricated using the parameters in Table 4, having first and second organic layers with different concentrations of phosphorescent material and non-emissive materials. FIG. 23 shows plots of normalized electroluminescent intensity versus wavelength for devices fabricated according to FIG. 22 using parameters from Table 4. FIG. 24 shows plots of luminous efficiency versus luminance for devices fabricated according to FIG. 22 using parameters from Table 4. FIG. 25 shows plots of external quantum efficiency versus luminance for devices fabricated according to FIG. 22 using parameters from Table 4. FIG. 26 shows plots of current density versus voltage for devices fabricated according to FIG. 22 using parameters from Table 4. FIG. 27 shows plots of luminance versus voltage for devices fabricated according to FIG. 22 using parameters from Table 4. FIG. 28 shows plots of normalized luminance versus time for devices fabricated according to FIG. 22 using parameters from Table 4. FIG. 29 shows an organic light emitting device that was fabricated using the parameters in Table 6, having first and second organic layers with different concentrations of phosphorescent material and non-emissive materials, some devices with a layer of NPD and some without a layer of NPD. FIG. 30 shows an organic light emitting device without a layer of NPD. FIG. 31 shows an organic light emitting device with a layer of NPD. FIG. 32 shows plots of external quantum efficiency versus luminance for the devices of FIG. 30 and FIG. 31. FIG. 33 shows plots of power efficacy versus luminance for the devices of FIG. 30 and FIG. 31. FIG. 34 shows plots of luminance versus voltage for the devices of FIG. 30 and FIG. 31. FIG. 35 shows plots of electroluminescent intensity versus wavelength for the devices of FIG. 30 and FIG. 31. FIG. 36 shows plots of normalized luminance versus time for the device of FIG. 30 at various initial luminances. FIG. 37 shows plots of normalized luminance versus time for the device of FIG. 31 at various initial luminances. FIG. 38 shows an organic light emitting device that has emission from both NPD and BAlq. FIG. 39 shows a plot of external quantum efficiency versus luminance for the device of FIG. 38. FIG. 40 shows a plot of power efficacy versus luminance for the device of FIG. 38. FIG. 41 shows a plot of luminance versus voltage for the device of FIG. 38. FIG. 42 shows a plot of electroluminescent intensity (arbitrary units) versus wavelength for the device of FIG. 38. FIG. 43 shows a plot of normalized luminance versus time for the device of FIG. 38. FIG. 44 shows an organic light emitting device that has emission only from Alq. FIG. 45 shows a plot of external quantum efficiency versus luminance for the device of FIG. 44. FIG. 46 shows a plot of power efficacy versus luminance for the device of FIG. 44. FIG. 47 shows a plot of luminance versus voltage for the device of FIG. 44. FIG. 48 shows a plot of electroluminescent intensity (arbitrary units) versus wavelength for the device of FIG. 44. FIG. 49 shows a plot of normalized luminance versus time for the device of FIG. 44. FIG. 50 shows an organic light emitting device having only a layer with a high hole conductivity between an emissive layer and the anode, and a hole blocking layer of the same material used as a non-emissive host in the emissive layer. FIG. 51 shows a plot of normalized luminescence versus time for the device of FIG. 50. FIG. 52 shows a plot of external quantum efficiency versus luminance for the device of FIG. 50. FIG. 53 shows a plot of power efficacy versus luminance for the device of FIG. 50. FIG. 54 shows a plot of luminance versus voltage for the device of FIG. 50. FIG. 55 shows a plot of EL intensity versus wavelength for the device of FIG. 50. FIG. 56 shows an organic light emitting device having only a layer with a high hole conductivity between an emissive layer and the anode, a hole blocking layer of the same material used as a non-emissive host in the emissive layer, and an emissive layer having first and second organic layers with different concentrations of phosphorescent material and non-emissive materials, where the concentration of phosphorescent material in the second organic layer is variable. FIG. 57 shows a plot of normalized luminescence versus time for the device of FIG. 56. FIG. 58 shows a plot of external quantum efficiency versus luminance for the device of FIG. 56. FIG. 59 shows a plot of power efficacy versus luminance for the device of FIG. 56. FIG. 60 shows a plot of luminance versus voltage for the device of FIG. 56. FIG. 61 shows a plot of EL intensity versus wavelength for the device of FIG. 56. FIG. 62 shows an organic light emitting device having only a layer with a high hole conductivity between an emissive layer and the anode, a hole blocking layer of the same material used as a non-emissive host in the emissive layer, and an emissive layer having first and second organic layers with different phosphorescent materials in the first and second organic emissive layers, where the concentration of phosphorescent material in the second organic emissive layer is variable. FIG. 63 shows a plot of external quantum efficiency versus luminance for the device of FIG. 62. FIG. 64 shows a plot of power efficacy versus luminance for the device of FIG. 62. FIG. 65 shows a plot of luminance versus voltage for the device of FIG. 62. FIG. 66 shows a plot of EL intensity versus wavelength for the device of FIG. 62. FIG. 8 shows a general phosphorescent OLED structure. In some aspects, a new architecture for a phosphorescent OLED is disclosed. FIG. 9 shows a simplified device architecture that incorporates a thick emissive layer (EML) between a hole injection layer (HIL) and a blocking layer (BL). It is demonstrated that when the NPD HTL is replaced with a COMPOUND B:COMPOUND A doped layer in a phosphorescent OLED, this leads to extremely long lifetime of a new green phosphorescent OLED. A green device has been demonstrated with 600 Å COMPOUND B:COMPOUND A 15% EML with an efficiency of 44 cd/A and an 80% lifetime of 65,000 h at 1000 nits, see Table 2, compare Example 1 to Comparative Example 2. In this device, the 600 Å COMPOUND B:COMPOUND A layer provides both electron and hole transport capabilities. COMPOUND B provides very stable matrix. COMPOUND A is provided as a hole-transporting dopant, because COMPOUND B has preferential electron transporting characteristics. The doped COMPOUND B:COMPOUND A layer can also be used as the HTL for red and blue structures. COMPOUND B:COMPOUND A is an example to demonstrate the concept of a doped HTL. COMPOUND A can also be used as a hole injection layer, and COMPOUND B can function as a layer between the emissive layer and the electron transport layer (if present) and subsequent cathode. Some features disclosed herein enable a significant improvement in phosphorescent OLED stability. This includes the utilization of a material (COMPOUND B), which was originally designed to be a host and has now been demonstrated to be an effective BL (blocking layer) and HTL (Hole transport layer). The following references are incorporated by reference in their entireties: Vadim Adamovich, Novel materials and techniques of fabrication for Organic light emitting diodes. PhD, Thesis. Published Nov. 25, 2003; Peter Mackenzie, Vadim Adamovich, Yeh Tung, Michael S. Weaver. EML ON ITO OLED DEVICES, Provisional application No. 60/763,189; U.S. Pat. No. 7,022,421; U.S. Pat. No. 7,078,113; US Patent Publication No. 2006/0280965. The low stability of CBP host, HPT blocking layer (BL) and NPD hole transporter layer (HTL) materials presents significant impediments to the realization of a stable and long-lived green phosphorescent OLED. Utilization of a more stable material such as, for example, COMPOUND B in a green Phosphorescent OLED in the emissive layer, BL and HTL allowed about 10 fold improvement of green phosphorescent OLED lifetime. The replacement of a NPD HTL with a layer of COMPOUND B doped with COMPOUND A for green devices dramatically improves device lifetime. The concept is also applicable to blue devices. Compound B is a very stable host material. Green structure and performance with Compound B used in various layers within a device as a host, blocking layer and component of the hole-transporting layer is disclosed. Table 1 shows device data on improving green Phosphorescent OLED stability. FIG. 8 shows a general device structure showing the structure of the layers from Table 1. As follows from Table 1 the introduction of COMPOUND B stable material into the device as a various layers significantly improves lifetime of the device. While not intending to be limited by theory, HTL replacement improves the device. It is believed that this may be especially important for green devices. NPD is not as stable in green devices as it is in other devices, such as red devices. Again, not intending to be limited by theory, it is believed that NPD may be degraded by electrons leaking through the emissive layer, and (or) by phosphorescent excitons. As shown in Table 1, the replacement of the NPD HTL for the more stable COMPOUND B:COMPOUND A layer improved device lifetime by a factor of 4. COMPOUND B transports electrons, and COMPOUND A dopant transports holes in the layers including both COMPOUND A and COMPOUND B. Replacement of NPD makes the lifetime of green devices similar to those of red devices (>100,000 h). The same concept of a doped HTL can be used utilizing other materials and can be applied to red and blue Phosphorescent OLEDs. Other device architectures that can considered include graded structures where the HIL is 100% the p-type dopant e.g. COMPOUND A and then a host material is introduced, e.g., COMPOUND B as one looks further from the anode. Multiple layers of differing concentrations (0-100%) of dopant and host can also be employed between the anode and BL or ETL. COMPOUND B may also be used as the host for red and blue-green emitters. COMPOUND B may also be used as the BL in red green, blue, or white devices or any other color. Devices with 600 Å COMPOUND B:COMPOUND A layer and COMPOUND B as a blocker were grown on different HILs (CuPc, Compound A and no HIL). Specific device examples with Compound B:Compound A doped HTL are summarized in Table 2. FIG. 21 provides the structure for the devices described in Table 2. The replacement of NPD with a stable doped HTL (COMPOUND B:COMPOUND A) results in significant enhancement of green device lifetime. The experimental results are shown in Tables 1 and 2 and the associated FIGs. Devices with 600 Å of COMPOUND B:COMPOUND A 15% layer, having both electron transport and hole transport capabilities due to the mixture of materials, was grown on various HILs (CuPc, COMPOUND A and no HIL) (Examples 2, 1 and 3, respectively of Table 2). The same device structure with 300 Å NPD HTL and 300 Å COMPOUND B:COMPOUND A 15% EML is shown as a comparative example. The device without NPD is far more stable than device with NPD HTL. In this device COMPOUND B host (matrix) and COMPOUND A (hole transporting and emissive dopant) are used in one layer. A superior performance, and the best performance for the devices measured in the particular experiment shown in Table 2, which is long lifetime in combination with high device efficiency and low operating voltage, is Example 5 from Table 2. The structure of Example 5 is shown in FIG. 9. This device has only three organic materials. HIL, EML and BL of this device can be considered as a Compound A: Compound B layer with graded concentrations from 100% of compound A next to ITO (hole injection interface) and 100% of compound B next to Alq ETL (electron injection interface). The devices of Tables 1 and 2 illustrate several points that are associated with superior device performance. Utilization of the same material (COMPOUND B example) as host in EML, matrix in HTL, neat as a blocking layer in the device. 6. Tryphenylene compounds as a component of HTL, host and blocking layer in the same device, for example a 3 component device. 7. Architectures 1-6, with or without an electron transport layer. 8. Architectures 1-7, using Compound B as the specific triphenylene compound. 9. Architectures 1-7 above, but using a carbazole compound instead of a triphenylene compound as the stable host. 10. Architecture 9, using mCBP or Compound R as the specific carbazole compound. Devices may be fabricated using a stable host material that is a triphenylene compound or a carbazole compound. The devices may include only 3 or only 2 organic components, and may include layers having different concentrations of the same materials. Table 3 shows examples of such devices. The structure for the devices of Table 3 is shown in FIG. 8. The designations in FIG. 8 regarding HTL and ETL are somewhat flexible, in that both of these layers are believed to emit in many of the structures, particularly those where the HTL and ETL have the same materials but in different concentrations. Devices 1 and 2 of Table 3 were actually fabricated, while devices 3 and 4 were not but are included for illustrative purposes. It is believed that Compound S is an example of a phosphorescent molecule that may transport electrons in an emissive layer. The devices have application in flat panel displays and in lighting applications. The superior devices demonstrated have the advantage of enabling longer lifetime in high efficiency phosphorescent OLEDs. No special fabrication equipment is necessary, and devices may be fabricated by methods known in the art. Shadow masking may be a consideration depending on whether common layers can be employed in the case of side by side RGB applications. FIG. 3 shows an organic light emitting device having first and second organic layers with different concentrations of phosphorescent material and non-emissive materials, and organic layers between the first organic layer and the anode with specific charge carrier mobility characteristics. As illustrated, the device of FIG. 3 includes a substrate 310, an anode 315, a third organic layer 320, an emissive layer having a first organic layer 330 and a second organic layer 340, a hole blocking layer 350, an electron transport layer 360, and a cathode 370. Hole blocking layer 350 and electron transport layer 360 are optional. The device of FIG. 3, and various other devices shown herein, is shown with the anode adjacent to the substrate, as is common for many devices, but the devices could also have the cathode adjacent to the substrate. First organic layer 330 is disposed between the anode and the cathode, and includes a phosphorescent material and a non-emissive material. The concentration of the phosphorescent material in the first organic layer is 10-90 wt %. The concentration of the non-emissive material in the first organic layer is 10-90 wt %. Second organic layer 340 is disposed between the first organic layer and the cathode. Second organic layer 340 is preferably in direct contact with first organic layer 330, but there may also be a thin organic layer in between first and second organic layers 330 and 340 that is capable of transporting both electrons and holes. Second organic layer also include a phosphorescent material and a non-emissive material. The concentration of the phosphorescent material in the second layer is 3-25 wt %. The concentration of the non-emissive material in the second organic layer is 75-97 wt %. The concentration of the phosphorescent material in the second organic layer is lower than the concentration of the phosphorescent material in the first organic layer. As a result of the different concentrations of phosphorescent materials in first and second organic layers 330 and 340, there is an “interface” between these layers. In one aspect, first and second organic layers 330 and 340 include only the phosphorescent material and the non-emissive material. This is favorable because minimizing the number of materials simplifies fabrication, and avoids failure mechanisms that may be associated with additional materials. FIG. 3, as well as other Figures, show organic layers that include a “phosphorescent” material and a “non-emissive” material. As used herein, the “phosphorescent” material is a material capable of emitting light from a triplet excited state at room temperature, for example, at about 18-25 degrees C. However, any given phosphorescent material may or may not emit light in a particular layer or in a particular device. In many of the architectures disclosed herein, the phosphorescent material does emit light. However, in other architectures, the phosphorescent material does not emit light, but rather transfers excitons to other molecules, which may be phosphorescent or fluorescent, which then emit light. The phosphorescent nature of the material still plays a role in these devices, because the ability to emit light from a triplet excited state at room temperature is correlated with other properties, such as intersystem crossing and strong spin orbit coupling, which allow triplets to efficiently form on the molecule and transfer to other molecules, even though it may not emit light. In addition, many phosphorescent materials are also good hole transporters. The definition of the term “phosphorescent” as defined this application is believed to be generally consistent with its use in the art, but is not intended to extend to other applications where the term may be used in a different manner. As used herein, the “non-emissive” material does not emit light in the device for which the material is described as “non-emissive.” However, the non-emissive material is not necessarily electrically inert in the device, and may often be involved with charge transport, most often electron transport. The material may be emissive in other contexts, for example in solution or in other devices. Generally, if the “non-emissive” material is capable of emitting light in contexts other than the device in which it is included as a non-emissive material, solid-state considerations in the particular device make it such that the material does not emit light in the device. For example, the “non-emissive” material may be doped with a phosphorescent material having a triplet energy that is at least 0.1 eV lower than that of the non-emissive material, such that any triplets that do form on the non-emissive material transfer to the phosphorescent material rather than emit light. Without being limited to any theory as to how aspects of the invention work, it is believed that, in many phosphorescent OLEDs, recombination occurs at or near an interface somewhere in the device, because electron and hole mobilities may be different on either side of the interface, and because electrons and holes may have difficulty crossing the interface. If the emissive layer does not include any internal interfaces, recombination may be likely to occur at or near the interface of the emissive layer with a non-emissive layer. Thus, excitons and both types of charge carriers are located in significant concentrations near the non-emissive layer in question. Where the non-emissive layer is susceptible to damage from excitons and/or charge carriers, device lifetime may be adversely affected. In addition, the proximity of a non-emissive layer to the recombination zone may provide non-emissive decay routes for excitons, adversely affecting device efficiency. It is further believed that, in many phosphorescent devices, the phosphorescent material is responsible for the transport of holes in the emissive layer, and that a non-emissive host material is responsible for the transport of electrons. It is believed that the change in concentration of phosphorescent material between first organic layer 330 and second organic layer 340 may cause the mobility of electrons to be higher in first organic layer 330 than in second organic layer 340, and the mobility of holes to be higher in second organic layer 340 than in first organic layer 330. As a result, recombination of electrons and holes may occur at or near the interface between first organic layer 330 and second organic layer 340. The concentration of phosphorescent material in second organic layer 340 is preferably at least 5 wt % lower than the concentration in first organic layer 330, and is more preferably at least 10 wt % lower. Together, first organic layer 330 and second organic layer 340 may form the emissive layer of the device. Because recombination occurs at or near an interface between first and second organic layers 330 and 340, i.e., at an interface within the emissive layer, issues caused by recombination near interfaces with a non-emissive layer may be avoided. The reasoning described in these paragraph applies to various devices described herein that have an emissive layer with an internal interface, i.e., an interface between the first and second organic layers. The phosphorescent material of first organic layer 330 and second organic layer 340 may be the same material, or may be different phosphorescent materials. The non-emissive material of first organic layer 330 and second organic layer 340 may be the same material, or different materials. Thus, there are four combinations: (1) same phosphorescent material in both first and second organic layers, and same non-emissive material in both first and second organic layers; (2) different phosphorescent material in the first and second organic layers, and same non-emissive material in both first and second organic layers; (3) same phosphorescent material in both first and second organic layers, and different non-emissive material in first and second organic layers; and (4) different phosphorescent material in the first and second organic layers, and different non-emissive material in the first and second organic layers. There are advantages to each combination. Using the same non-emissive material in both first organic layer 330 and second organic layer 340 simplifies fabrication by reducing the number of materials in the device. In addition, since each new material may introduce new failure mechanisms, using the same material in multiple layers may reduce failure mechanisms. Using the same non-emissive material may also assist in spreading out the recombination zone for the device, which is also helpful to achieving higher device lifetime, while still allowing recombination to occur near an interface between first organic layer 330 and second organic layer 340 by adjusting the concentration of non-emissive materials at the interface. However, using different non-emissive materials in first organic layer 330 and second organic layer 340 also has advantages. Different materials may have different charge transport properties. Where the non-emissive materials are predominantly responsible for the transport of a particular charge carrier, most often electrons, using different non-emissive materials in first organic layer 330 and second organic layer 340 may make it easier to control where recombination occurs in the device. Specifically, by choosing different non-emissive materials for first organic layer 330 and second organic layer 340, it may be easier to create a gradient of charge carriers near an interface between first organic layer 330 and second organic layer 340, because the difference in non-emissive materials may be used for this purpose in addition to the concentration of non-emissive materials. Using the same phosphorescent material in both first organic layer 330 and second organic layer 340, but at different concentrations, has many of the same advantages as described above with respect to use of the same non-emissive material. Fewer materials may mean fewer failure mechanisms. The different concentrations may allow recombination to be controlled to occur near an interface between first organic layer 330 and second organic layer 340, while the use of the same phosphorescent material allows the recombination zone to be relatively broad. Using different phosphorescent materials in both first organic layer 330 and second organic layer 340, at different concentrations, has many of the same advantages as described above with respect to the use of different non-emissive materials. The use of different materials may add an extra parameter that may be used to control where recombination occurs. In addition, the phosphorescent materials may or may not emit light in the device. Where highly efficient saturated emission is desired, perhaps for use in a display device that requires saturated emission, it may be preferable to use the same phosphorescent material in both first organic layer 330 and second organic layer 340 as the emissive material. In a configuration where the phosphorescent material(s) transports charge but do not emit, an additional material, described as an “lower energy” material, may be added to first organic layer 330 and second organic layer 340, and emit light. By “lower energy,” it is meant that the peak of the emission spectra of the lower energy emissive material is at least 20 nm higher than the peak of the emission spectra of the phosphorescent material in the same layer. Higher wavelengths correspond to lower energies. Excitons may be present on the lower energy emissive material through a variety of mechanisms, and the way in which excitons reach the lower energy emissive material is not intended to be limiting. For example, excitons may form on the phosphorescent material and transfer to the lower energy emissive material, or excitons may form directly on the lower energy emissive material. In one configuration, the lower energy emissive material may be a fluorescent material that accepts excitons from the phosphorescent material, including excitons that form as triplets on the phosphorescent material. However, where less saturated emission is desired, perhaps white emission for general illumination purposes, it may be desirable to have multiple molecules emitting in the same device. To this end, different phosphorescent materials may be used in first and second organic layers 330 and 340 as the emitters in those layers, such that there are multiple emissive materials in the device. An additional material or materials, described as “lower energy” materials, may also be added to one or both of first and second organic layers 330 and 340. Where emission from multiple materials is desired, different lower energy emissive materials may be used in both first and second organic layers 330 and 340, or a lower energy emissive material may be used in one of the first and second organic layers 330 and 340 while the phosphorescent material emits from the other of the first and second organic layers 330 and 340. However, devices having emissive layers with a first and second organic layer having an interface between them may still be subject to short lifetimes. It is believed that a leading failure mechanism in many phosphorescent organic light emitting devices involves electrons passing from the cathode, through the emissive layer, to organic layers on the anode side of the emissive layer. It is believed that many organic materials that are used on the anode side of OLEDs are vulnerable to damage from such electrons. FIGS. 44-50 and the associated text show the role of a common hole transport material, NPD, in shortening device lifetime. The use of an emissive layer having first and second organic layers 330 and 340 favorably allows recombination to occur at an interface within the emissive layer. As a result, the number of excitons that reach a non-emissive layer, and the number of charge carriers that cross the entire emissive layer to reach the other side (i.e., electrons reaching the anode side of the emissive layer and holes reaching the cathode side of the emissive layer) may be reduced. However, it is favorable to have a recombination zone that is spread out, which is enabled by the device architectures described herein, such that excitons and/or charge carriers may reach and damage a non-emissive layer, adversely affecting device lifetime. It is believed that one common failure mechanism involves electrons crossing the emissive layer to reach the anode side of the emissive layer, and damaging the adjacent non-emissive layer. One way to avoid the damage and shorter device lifetimes caused by electrons damaging organic materials on the anode side of the emissive layer is to use on the anode side of the emissive layer only materials that have a hole mobility that is significantly higher than the electron mobility. The difference should be significant enough that the majority of charge carriers is of one type in that layer. With reference to FIG. 3, third organic layer 320 is on the anode side of the emissive layer, i.e., first and/or second organic layers 330 and 340. There may be more than one organic layer in the position occupied by third organic layer 320. Each organic layer between the emissive layer and the anode may include a single organic material, or multiple organic materials. For single material layers, this means that the material of each layer has a hole mobility that is significantly higher than the electron mobility of that layer. For a layer including multiple materials, this means that the hole mobility of the layer is significantly higher than the electron mobility of the layer. The hole mobility of a “layer” is strongly correlated with the hole mobility of the material in that layer that is predominantly responsible for transporting holes in the layer, particularly where the material in question is present in significant quantities. Electron and hole mobilities may be measured by various methods, including time of flight, dark current injection, and admittance spectroscopy. By significantly higher, it is meant that the hole mobility is at least twice the electron mobility, preferably at least ten times as great as the electron mobility, and most preferably at least 100 times as great as the electron mobility. NPD is traditionally used a hole transport layer (HTL) and it is often in contact with the EML. However, So et al. report that NPD has an electron mobility that is similar to its hole mobility (˜5×10−4 cm2V−1s−1). See, So et al., ‘Bipolar Carrier Transport in Organic Small Molecules for OLED,’ Proceedings of the Society for Information Display. 38, 1497 (2007). This suggests that electrons may easily be transported by NPD in conventional structures. This enables two potentially unfavorable situations. Firstly, electrons and holes may recombine in NPD. NPD may be a stable hole transport layer but devices that exhibit NPD emission are not expected to be operationally stable because the emission is inefficient and NPD was not included in the device for this purpose. For example, a device with NPD and BAlq emissions is shown in FIG. 38. The lifetime (LT50) of this device, shown in FIG. 43, is less than 300 hrs when the device is drive at a constant current of 20 mA/cm2. For comparison, a similar device (see FIG. 44) with only Alq emission has a much longer life time. The luminance of the Alq emitting device drops to about 86% (see FIG. 49) of its initial value after 300 hrs and for a continuous drive current of 40 mA/cm2. Secondly, NPD may be intrinsically unstable to electrons. There is ample evidence to believe that NPD is stable in hole only devices; however, its stability to electrons is not established. In a preferred aspect, third organic layer 320 is a single organic layer disposed between first organic layer 330 and anode 315, i.e., third organic layer 320 is in direct contact with first organic layer 330 and anode 315. Also in this preferred aspect, third organic layer 320 includes only the phosphorescent material of first organic layer 330. In general, electrons are present in the emissive layer of a device, and the emissive material of a device is exposed to electrons in the emissive layer. As a result, most phosphorescent emissive molecules that are used in devices having reasonably long lifetimes are resistant to damage from electrons. Thus, using the phosphorescent material of first and second organic layers 330 and 340 in an additional role, as the only organic material between first organic layer 330 and anode 315, i.e. as a hole transport molecule, may result in a device that avoids failure mechanisms associated with electron damage to organic layers on the anode side of the emissive layer. Another way to avoid damage and shorter lifetimes caused by electrons damaging organic materials on the anode side of the emissive layer is to avoid using classes of materials on the anode side of the emissive layer that are susceptible to damage from electrons. It is believed that many materials commonly used on the anode side of the emissive layer are susceptible to such damage. NPD is one example of such materials. More generally, materials that may be favorably avoided on the anode side of the emissive layer include molecules having a group from the following list: triarylamine, napthyl, tri(N-carbazoyl)triphenylamine, tetraarylamine and carbazole. Another way to avoid damage and shorter lifetimes caused by electrons damaging organic materials on the anode side of the emissive layer is to use materials on the anode side of the emissive layer having a high hole conductivity. A high hole conductivity may allow holes to be injected into the emissive layer at a rate sufficient to minimize the number of electrons reaching the anode side of the emissive layer. In an OLED, a useful measure of the conductivity of a layer is the voltage rise caused in a device by making a particular layer thicker. Specifically, several otherwise identical devices may be fabricated, except for one difference—the devices have a particular layer for which conductivity is being measured that has different thicknesses in different devices. Because the devices are otherwise identical, the voltage difference caused by an increase in the thickness of a particular layer may be isolated from the voltage difference due to various interfaces and layers other than the one for which conductivity is being measured. Hole conductivity specifically may be measured by performing such a measurement in a device where the layer of varying thickness is located in the device at a location where, based on the other layers in the device, electrons do not reach in large quantities and holes are the predominant charge carrier. Parameters such as carrier mobility that affect conductivity may be a function of current, although it is believed that the dependence is mild. To control for this factor, the measurements may be performed at a particular current density. 10 mA/cm2 is a suitable current density that was used for the measurements described herein. The hole conductivity of NPD has been measured in this way, and it was demonstrated that the voltage across the device at a current of 10 mA/cm2 increases by 0.6 V for each additional 10 nm of NPD thickness. The hole conductivity of LG101™ (available from LG, Korea) was measured in a similar way, and it was demonstrated that the voltage across the device at a current of 10 mA/cm2 increases by less than 0.5 V for each additional 10 nm of LG101 thickness. These measurements are repeatable across a wide variety of device structures. A device having between the emissive layer and the anode only layers for which the voltage across the device rises by 0.1 V or less per additional 10 nm of layer thickness may favorably minimize damage to organic layers on the anode side of the emissive layer. A layer of LG101 is one example of such a layer. Another way to avoid damage and shorter lifetimes caused by electrons damaging organic materials on the anode side of the emissive layer is to use only organometallic materials on the anode side of the emissive layer. It is believed that organometallic materials, particularly those known for use as phosphorescent emitters in organic light emitting device, are generally more resistant to damage from electrons than certain materials commonly used in hole transport layers, such as NPD. Indeed, organometallic materials used as emitters are exposed to an environment relatively rich in electrons in the emissive layer(s) of a device. Using such materials in the relatively electron poor anode side of the device should not result in significant electron damage. In addition, many organometallic materials used as emitters in organic light emitting devices are good hole transporters, and are believed in many cases to be responsible for hole transport in the emissive layers of an organic light emitting device. Another way to avoid damage and shorter lifetimes caused by electrons damaging organic materials on the anode side of the emissive layer is to use a high triplet energy material for the first non-emissive material (i.e. the non-emissive material of the first organic layer), such as first organic layer 330. It is believed one damage mechanism that reduces device lifetime may involve triplets reaching the anode side of the emissive layer, and damaging organic materials on the anode side of the emissive layer. In a device architecture having an interface within the emissive layer, it is believed that recombination (i.e., exciton formation, including triplet formation) occurs at or near this interface. Depending upon the relative triplet energies of the various materials in the emissive layer, triplets may be present on the non-emissive material as well as the phosphorescent material. By choosing a high triplet energy material for the non-emissive material of the first organic layer, the number of triplets that are able to form on and/or transfer to the non-emissive material from other materials may be reduced. In addition, it would be energetically favorable for any triplets that are present on this non-emissive material to transfer to other molecules in the emissive layer having lower triplet energies. Because the first organic layer is within the emissive layer but on the anode side, the concentration of phosphorescent material is higher than in the second organic layer, providing more sites to which triplets can transfer from the non-emissive material of the first organic layer. Thus, using a high triplet energy material for the first non-emissive material may reduce the number of excitons reaching the anode side of the emissive layer. In this context, a “high” triplet energy material is a material having a triplet energy of 2.7 eV or greater. Device lifetime is a particularly important issue for blue emitting phosphorescent devices, i.e., devices having a phosphorescent material with an emission spectra with its peak at a wavelength between 440 nm and 500 nm. This is because blue photons are the highest energy photons in the visible spectrum, such that blue emitting organic molecules generally have correspondingly higher triplet and/or singlet energies. As a result, many materials in a blue emitting device may be exposed to higher energy excitons and/or charge carriers than other devices. Also, the selection of materials available for use in a blue device may be limited by constraints on particular properties relating to highest occupied molecular orbitals, lowest unoccupied molecular orbitals, band gap, etc., in order to ensure proper charge transport in the device, whereas the constraints on devices emitting lower energy photons may be more relaxed. Because the selection of materials for blue devices is limited, some of the more desirable materials used for devices that emit green or red may not be viable choices for blue emitting devices. Device lifetime is also important for green emitting devices, i.e., devices having a phosphorescent material with an emission spectra with its peak at a wavelength between 500 nm and 530 nm. Some of the same issues described for blue devices apply to green devices, but to a lesser extent. Thus, many of the features described herein are particularly desirable for use in devices having these wavelengths, particularly blue. However, the features may be used in devices that emit any color. Preferably, the total thickness of first organic layer 330 and second organic layer 340 is at least 400 Å, and the thickness of first organic layer 330 is at least 50 Å and the thickness of second organic layer 340 is at least 50 Å. At these thicknesses, the total thickness of first and second organic layers 330 and 340 is sufficiently large to allow for a wide recombination zone. Also, the minimum thicknesses for each of the layers means that the interface between first and second organic layers 330 and 340, at which or near much of the recombination may occur, is at least 50 Å away from other layers that may contain other materials. As a result, any device lifetime issues caused by such other materials may be reduced. Preferably, the phosphorescent material has a highest occupied molecular orbital that is at least 0.3 eV higher than the highest occupied molecular orbital of the non-emissive material. As a result, it is likely that hole transport in first and second organic layers 330 and 340 will occur predominantly on the phosphorescent material. As a result, the difference in concentration of the phosphorescent material between first and second layers 330 and 340 is likely to result in a significant difference in the hole transport properties of the two layers, such that recombination occurs at or near the interface between the two layers. When hole blocking layer 350 is present, there are several preferred material selections for the layer. Without intending to be limited to any theory as to why aspects of the invention work, the purpose of hole blocking layer 350 is to prevent holes from moving from second organic layer 340 into hole blocking layer 350. Hole blocking layer 350 is disposed between second organic layer 340 and cathode 360, and is in direct contact with second organic layer 340. Layer 350 may also be referred to as a “fourth” organic layer. One way to prevent holes from moving into hole blocking layer 350 is to use the non-emissive material of first and second organic layers 330 and 340 for hole blocking layer 350. Because the phosphorescent material of first and second organic layers 330 and 340 is not present in hole blocking layer 350, and that material is responsible for hole transport in first and second organic layers 330 and 340, holes may not be able to enter hole blocking layer 350. This is particularly true where the phosphorescent material has a highest occupied molecular orbital that is at least 0.3 eV higher than the highest occupied molecular orbital of the non-emissive material, as described above. The use of this particular non-emissive material in hole blocking layer 350 is desirable for several reasons. First, the material is already present in first and second organic layers 330 and 340, so the use of this material in hole blocking layer 350 should not introduce any additional materials related failure mechanisms to the device. Second, it is believed that, in many devices, the non-emissive material of an emissive layer is predominantly responsible for electron transport in the emissive layer, such that there should not be any issues caused by the use of this material for transporting electrons from the cathode side of the emissive layer and injecting them into the emissive layer. In addition, fabrication is simplified by keeping the number of different materials to a minimum. Preferably, hole blocking layer includes only the non-emissive material of first and second organic layers 330 and 340, possibly with minor impurities that do not affect device properties. However, other materials may also be used for hole blocking layer 350, such as materials having highest occupied molecular orbitals at least 0.3 eV higher then that of the phosphorescent material of second organic layer 340. Layer 350 may also serve to block excitons from leaving second organic layer 340. Preferably, layer 350 includes only materials having a triplet energy at least 0.1 eV higher than the triplet energy of the emissive dopant. Another way to avoid damage and shorter lifetimes caused by electrons damaging organic materials on the anode side of the emissive layer is to simply avoid using any organic materials on the anode side of the emissive layer. FIG. 4 shows an organic light emitting device with an emissive layer having first and second organic layers with different concentrations of phosphorescent material and non-emissive materials, and no organic layers between the first organic layer and the anode. As illustrated, the device of FIG. 4 includes a substrate 410, an anode 415, an emissive layer having a first organic layer 430 and a second organic layer 440, a hole blocking layer 450, an electron transport layer 460, and a cathode 470. Hole blocking layer 450 and electron transport layer 460 are optional. First organic layer 430 is disposed between the anode and the cathode, and includes a phosphorescent material and a non-emissive material. The concentration of the phosphorescent material in the first organic layer is 10-90 wt %. The concentration of the non-emissive material in the first organic layer is 10-90 wt %. Second organic layer 440 is disposed between the first organic layer and the cathode, and is in direct contact with first organic layer 430. Second organic layer includes the phosphorescent material and the non-emissive material of the first organic layer. The concentration of the phosphorescent material in the second layer is 3-25 wt %. The concentration of the non-emissive material in the second organic layer is 75-97 wt %. The concentration of the phosphorescent material in the second organic layer is lower than the concentration of the phosphorescent material in the first organic layer. In one aspect, first and second organic layers 430 and 440 include only the phosphorescent material and the non-emissive material. The device of FIG. 4 relies on a combination of features to achieve a long-lived device. Simply avoiding the use of any organic layers between the anode and an emissive layer is not likely to result in a good device, because of issues caused by the anode-emissive layer interface, and particularly by recombination at or near that interface. However, the device of FIG. 4 also includes different layers with different concentrations of phosphorescent emissive dopant. As with the device of FIG. 3, it is believed that the change in concentration of phosphorescent material between first organic layer 430 and second organic layer 440, resulting in an interface within the emissive layer, may cause the mobility of electrons to be higher in first organic layer 430 than in second organic layer 440, and the mobility of holes to be higher in second organic layer 440 than in first organic layer 430. As a result, recombination of electrons and holes may occur at or near the interface between first organic layer 430 and second organic layer 440. Thus, the device of FIG. 4 avoids issues that may have been present in prior devices with an emissive layer in contact with an anode. The device of FIG. 4 also avoids issues that may have been present in prior devices caused by electron damage to organic materials between the emissive layer and the anode, because the device of FIG. 4 does not have any such organic materials to be damaged by electrons. FIG. 5 shows an organic light emitting device having only three organic materials. As illustrated, the device of FIG. 5 includes a substrate 510, an anode 515, a third organic layer 520, an emissive layer having a first organic layer 530 and a second organic layer 540, a hole blocking layer 550, an electron transport layer 560, and a cathode 570. First organic layer 530 is disposed between the anode and the cathode, and includes a phosphorescent material and a non-emissive material. The concentration of the phosphorescent material in the first organic layer is 10-90 wt %. The concentration of the non-emissive material in the first organic layer is 10-90 wt %. Second organic layer 540 is disposed between the first organic layer and the cathode, and is in direct contact with first organic layer 530. Second organic layer includes the phosphorescent material and the non-emissive material of the first organic layer. The concentration of the phosphorescent material in the second layer is 3-25 wt %. The concentration of the non-emissive material in the second organic layer is 75-97 wt %. The concentration of the phosphorescent material in the second organic layer is lower than the concentration of the phosphorescent material in the first organic layer. First and second organic layers 530 and 540 include only the phosphorescent material and the non-emissive material. Third organic layer 520 includes only the phosphorescent material of first organic layer 530, and is in direct contact with first organic layer 530. In third organic layer 520, the phosphorescent material may not actually emit, but rather may serve to transport holes from anode 515 and inject the holes into first organic layer 530. Hole blocking layer 550 includes only the non-emissive material of first organic layer 530. Without being limited to any theory as to how aspects of the invention work, it is believed that hole transport in first and second layers 530 and 540 occurs on the phosphorescent material, and that such transport does not occur on the non-emissive material. As a result, hole blocking layer 550 is unable to transport holes from second organic layer 540, and acts as a hole blocking layer. Thus, there are only two organic materials used between third organic layer 520, first organic layer 530, second organic layer 540, and third organic layer 550. The third organic material in the device of FIG. 5 is an electron transporting material present as the only material in electron transport layer 560. While many of the devices illustrated herein have various layers that may or may not be present in aspects of the invention as practiced, the specific device illustrated in FIG. 5 is intended to have exactly the layers shown, with no additions and no omissions, and is intended to include only three organic materials. As a result, damage mechanisms associated with extra layers and extra organic materials may be avoided. The phosphorescent material is the emissive material of the device. In a different aspect, the device of FIG. 5 may be modified in a limited way to include a fourth organic material, such that the device includes only four organic materials, and one of the organic materials is an electron transport material present in the device only between the emissive layer and the cathode. This aspect allows for three organic materials to be present in the emissive layer of the device, plus any hole transport, hole injection, and/or blocking layers that are present in the device. For example, the device may include two different phosphorescent materials and a single non-emissive material in the emissive layer, a single phosphorescent material and two different non-emissive materials in the emissive layer, or a phosphorescent material, a non-emissive material, and a lower energy emissive material. FIG. 6 shows an organic light emitting device similar to that of FIG. 3, but including multiple phosphorescent materials. As illustrated, the device of FIG. 6 includes a substrate 610, an anode 615, a third organic layer 620, an emissive layer having a first organic layer 630 and a second organic layer 640, a hole blocking layer 650, an electron transport layer 660, and a cathode 670. Third organic layer 620, hole blocking layer 650 and electron transport layer 660 are optional. First organic layer 630 is disposed between the anode and the cathode, and includes a first phosphorescent material and a non-emissive material. The concentration of the first phosphorescent material in the first organic layer is 3-50 wt %. The concentration of the non-emissive material in the first organic layer is 10-97 wt %. Second organic layer 640 is disposed between first organic layer 630 and the cathode, and is in direct contact with first organic layer 630. Second organic layer 640 includes the first phosphorescent material and the non-emissive material of the first organic layer. The concentration of the first phosphorescent material in the second layer is 3-25 wt %. The concentration of the non-emissive material in the second organic layer is 10-90 wt %. The concentration of the first phosphorescent material in the second organic layer is lower than the concentration of the phosphorescent material in the first organic layer. First organic layer 630, second organic layer 640, or both, include a lower energy emissive material present in a concentration 0.1-12 wt %. The lower energy emissive material may be a fluorescent emissive material. Where the lower energy emissive material is fluorescent, the device may exhibit phosphorescent-sensitized fluorescent emission, i.e., energy may be transferred from triplets on the first phosphorescent material to the fluorescent emissive material. Both first organic layer 630 and second organic layer 640 may include the lower energy emissive material present in a concentration 0.1-12 wt %. Or, only first organic layer 630 may include the lower energy emissive material present in a concentration 0.1-12 wt %, while second organic layer 640 does not include the lower energy emissive material. Or, only second organic layer 640 may include the lower energy emissive material present in a concentration 0.1-12 wt %, while first organic layer 630 does not include the lower energy emissive material. In one aspect, first organic layer 630 includes only the first phosphorescent material and the non-emissive material, and second organic layer 640 includes only the first phosphorescent material, the non-emissive material, and the lower energy emissive material. In this particular aspect, because the sum of the percentages from all of the materials in any given layer adds to 100%, the concentration of the non-emissive material in the first organic layer is 50-97 wt %, and the concentration of the non-emissive material in the second organic layer is 63-90 wt %. Both the first phosphorescent material and the lower energy emissive material may emit in the device of FIG. 6. For example, if the first phosphorescent material is the only emissive material present in first organic layer 630, it may emit from that layer. If both the first phosphorescent material and the lower energy emissive material are present in second organic layer 640, and the lower energy emissive material is phosphorescent with a lower triplet energy than the first phosphorescent material, emission from the second phosphorescent material may be favored in second organic layer 640. However, depending upon the concentrations of the first and second phosphorescent materials in second organic layer 640, there may still be some emission from the first phosphorescent material in second organic layer 640. In any event, first phosphorescent material may emit from first organic layer 630. As a result, the device of FIG. 6 may have multiple emissive materials with different emission spectra, such that a broad overall emission for the device may be achieved. Such an emission spectrum is desirable for certain applications, such as general illumination. FIG. 7 shows an organic light emitting device with an emissive layer having first and second organic layers with different concentrations of phosphorescent material and non-emissive materials, and organic layers between the first organic layer and the cathode with specific charge carrier mobility characteristics. The device of FIG. 7 applies concepts similar to those described for FIG. 3, but as applied to a device where a phosphorescent material is predominantly responsible for electron transport in the emissive layer and not hole transport. While the most common phosphorescent devices do not include an emissive layer where electrons are transported on the phosphorescent material, it is believed that Compound S is an example of a phosphorescent molecule that may transport electrons in an emissive layer. As illustrated, the device of FIG. 7 includes a substrate 710, an anode 715, a third organic layer 720, a first organic layer 730, a second organic layer 740, a hole blocking layer 750, an electron transport layer 760, and a cathode 770. Third organic layer 720, hole blocking layer 750 and electron transport layer 760 are optional. First organic layer 730 is disposed between the anode and the cathode, and includes a phosphorescent material and a non-emissive material. The concentration of the phosphorescent material in the first organic layer is 3-25 wt %. The concentration of the non-emissive material in the first organic layer is 75-97 wt %. Second organic layer 740 is disposed between the first organic layer and the cathode, and is in direct contact with first organic layer 730. Second organic layer 740 includes the phosphorescent material and the non-emissive material of the first organic layer. The concentration of the phosphorescent material in the second organic layer is 10-90 wt %. The concentration of the non-emissive material in the second organic layer is 10-90 wt %. The concentration of the phosphorescent material in the second organic layer is higher than the concentration of the phosphorescent material in the first organic layer. The device of FIG. 7 operates on a principle similar to that of FIG. 3, but different in that is intended for material combinations where a phosphorescent emissive dopant is responsible for electron transport, but not hole transport. Thus, second organic layer 740, which closer to cathode 770 than first organic layer 730, has a higher concentration of the electron-transporting phosphorescent material than first organic layer 730. Thus, electron mobility should drop in first organic layer 730 relative to second organic layer 740, such that recombination may occur at or near the interface between first organic layer 730 and second organic layer 740. FIG. 8 shows an organic light emitting device that was fabricated using the parameters in Tables 1 and 3. FIG. 10 shows a specific organic light emitting device that was fabricated and tested. The device of FIG. 10 includes only four organic materials: COMPOUND A, COMPOUND F, mCBP and Alq. Specifically, the device of FIG. 10 includes, in order, an ITO anode, a 10 nm thick hole injection layer of COMPOUND A, a 60 nm thick emissive layer of mCBP doped with 15% COMPOUND F, a 5 nm thick hole blocking layer of mCBP, a 20 nm thick electron transport layer of Alq, a 0.5 nm thick inorganic electron injection layer of LiF, and a 100 nm thick Al cathode. FIG. 15 shows a specific organic light emitting device that was fabricated and tested. The device of FIG. 15 includes only three organic materials: COMPOUND F, mCBP and Alq. Specifically, the device of FIG. 15 includes, in order, an ITO anode, a 10 nm thick hole injection layer of COMPOUND F, a 60 nm thick emissive layer of mCBP doped with 15% COMPOUND F, a 5 nm thick hole blocking layer of mCBP, a 20 nm thick electron transport layer of Alq, a 0.5 nm thick inorganic electron injection layer of LiF, and a 100 nm thick Al cathode. The device of FIG. 15 is similar to the device of FIG. 10, except that COMPOUND F is used for the hole injection layer instead of COMPOUND A. Notably, COMPOUND F is also the emissive material in the device of FIG. 15. The device of FIG. 15, and the experimental results plotted in FIGS. 16-19, show that the device of FIG. 15 has measured results similar to that of FIG. 10. This is evidence that COMPOUND F is a good hole transporter, similar to COMPOUND A. If COMPOUND F did not have hole transport properties comparable to those of COMPOUND A, it would be expected that the device of FIG. 15 would exhibit poorer performance than that of FIG. 10 as a result of COMPOUND F being less able to transport holes. FIG. 22 shows an organic light emitting device that was fabricated using the parameters in Table 4, having first and second organic layers with different concentrations of phosphorescent material and non-emissive materials. Table 5 shows device performance for the devices of Table 4. FIG. 29 shows an organic light emitting device that was fabricated using the parameters in Table 6, having first and second organic layers with different concentrations of phosphorescent material and non-emissive materials, some devices with a layer of NPD and some without a layer of NPD. The data in Table 6 shows that the introduction of a 100 Å layer of NPD between a hole injection layer and an emissive layer reduces the lifetime of a red emitting device. FIG. 50 shows an organic light emitting device having only a layer with a high hole conductivity between an emissive layer and the anode, and a hole blocking layer of the same material used as a non-emissive host in the emissive layer. The device of FIG. 50 includes a 10 nm thick hole injection layer of LG101, a 60 nm thick first organic emissive layer of COMPOUND J doped with 15 wt % COMPOUND H, a 25 nm thick hole blocking layer of COMPOUND J, a 20 nm thick electron transport layer of Alq, and a LiF/Al cathode. FIG. 56 shows an organic light emitting device having only a layer with a high hole conductivity between an emissive layer and the anode, a hole blocking layer of the same material used as a non-emissive host in the emissive layer, and an emissive layer having first and second organic layers with different concentrations of phosphorescent material and non-emissive materials, where the concentration of phosphorescent material in the second organic layer is variable. The device of FIG. 56 includes a 10 nm thick hole injection layer of LG101, a 30 nm thick first organic emissive layer of COMPOUND J doped with 30 wt % COMPOUND H, a 30 nm thick second organic emissive layer of COMPOUND J doped with X wt % COMPOUND H, a 25 nm thick hole blocking layer of COMPOUND J, a 20 nm thick electron transport layer of Alq, and a LiF/Al cathode. X varies from 10 wt % to 18 wt % in the devices fabricated, with devices at X=10, 14 and 18 wt % as indicated in the legends for FIG. 57. The device of FIG. 56 is very similar to that of FIG. 50, with the difference being that there is a step in the concentration of dopant H in the device of FIG. 56, but not in the device of FIG. 50. The device of FIG. 56 may be compared to the device of FIG. 50. In terms of device architecture, the devices are similar except in the emissive layer, where the device of FIG. 56 has a step in the concentration of COMPOUND H, whereas the device of FIG. 50 does not. The measured results for these two devices show that the device of FIG. 56 has a lower operating voltage, enabled by the step in dopant concentration. The device of FIG. 56 also has better blue CIE coordinates that the device of FIG. 50. It is believed that the better CIE coordinates are due to optical effects resulting from recombination closer to the cathode in the device of FIG. 56, due to increased hole conductivity in the layer doped with 30% COMPOUND H. The device of FIG. 56 also exhibits higher external quantum efficiency than the device of FIG. 50. It is believed that the higher efficiency in the device of FIG. 56 is due to more spread out recombination due to the step in dopant concentration, and a better balance of electrons and holes at the recombination location. In addition, recombination often occurs at interfaces, and the device of FIG. 56 has three interfaces involving a layer that can emit light due to the step in concentration, whereas the device of FIG. 50 has only two such interfaces. FIG. 62 shows an organic light emitting device having only a layer with a high hole conductivity between an emissive layer and the anode, a hole blocking layer of the same material used as a non-emissive host in the emissive layer, and an emissive layer having first and second organic layers with different phosphorescent materials in the first and second organic emissive layers, where the concentration of phosphorescent material in the second organic emissive layer is variable. The device of FIG. 62 includes a 10 nm thick hole injection layer of LG101, a 30 nm thick first organic emissive layer of COMPOUND J doped with 30 wt % COMPOUND A, a 30 nm thick second organic emissive layer of COMPOUND J doped with X wt % COMPOUND H, a 25 nm thick hole blocking layer of COMPOUND J, a 20 nm thick electron transport layer of Alq, and a LiF/Al cathode. X varies from 10 wt % to 18 wt % in the devices fabricated, with devices at X=10, 14 and 18 wt % as indicated in the legends for FIG. 57. The device of FIG. 62 is very similar to that of FIG. 56, with the difference being that the device of FIG. 62 uses different emissive phosphorescent material in the first and second organic emissive layers, while the device of FIG. 56 uses the same phosphorescent material in both layers. The concentrations of the phosphorescent materials are the same in the device of FIG. 56 compared to the device of FIG. 62. The device of FIG. 62 may be compared to the device of FIG. 56. In terms of device architecture, the devices are similar except in the emissive layer, where the device of FIG. 62 has an emissive layer doped with phosphorescent emitter COMPOUND A and another emissive layer doped phosphorescent emitter COMPOUND H, whereas the device of FIG. 56 has only phosphorescent emitter COMPOUND H. Both devices have a step in dopant concentration, and similar concentrations even in the layers where the actual dopant is different. Several points can be understood from comparing these two device architectures. First, the device of FIG. 62 exhibits a broad emission spectra that is a combination of emission from both COMPOUND A and COMPOUND H. As a result, it can be inferred that the device of FIG. 56 is emitting from both the layer doped with 30% COMPOUND H and the layer doped with a lesser concentration of COMPOUND H. Comparing FIG. 58 to FIG. 63, it can be seen that the device of FIG. 62 has better charge balance than the device of FIG. 56, as evidenced by a relatively flat external quantum efficiency over three orders of magnitude for the device of FIG. 62 as compared to two orders of magnitude for the device of FIG. 56. A number of devices were fabricated having two different doped emissive layers, where the devices do not include a hole transport layer using a material such as NPD. Table 7 shows the structures for these devices. Table 8 shows measured experimental results for these devices. In general, the devices had an ITO anode, a hole injection layer of LG101, and an emissive layer having a first organic layer and a second organic layer with an interface in between. Some of the devices had a hole blocking layer. All of the devices had an electron transport layer of LG201, available from the same source as LG101, and an LiF/Al cathode. Devices 1, 2 and 4 include the same non-emissive material in the first and second organic layers, but different phosphorescent materials. Devices 5-8 have first and second organic layers with different non-emissive materials and different phosphorescent materials. Devices 9, 11 and 12 have first and second organic layers with different non-emissive materials and different phosphorescent materials, where the first organic layer additionally includes an emissive material. Devices 13-22 have first and second organic layers with the same non-emissive materials, and different phosphorescent materials, where the first organic layer additionally includes a lower energy emissive material. All of devices 1, 2, 4, 5-8, 9, 11, 12, and 13-22 include emissive layers having a first and second organic layer with an interface in between. In most of these devices, the concentration of phosphorescent material is higher in the first (closer to anode) organic layer. However, in devices 8 and 9 the concentration of the phosphorescent material is higher in the second organic layer. The emissive layer of Device 3 does not include first and second organic layers, each having a non-emissive material and a phosphorescent material, with an interface in between. Neither does the emissive layer of Device 10, because Compound B is non-emissive in Device 10. and 10 do not include first and second organic layers, each having a non-emissive material and a phosphorescent material. Table 9 shows device structures and measured experimental results for some devices having an emissive layer with an interface between a first organic layer and a second organic layer, where the host and the dopant, i.e., the non-emissive material is the same material in both layers and the phosphorescent material is the same material in both layers, but the concentrations are different. All of the devices in Table 9 had a 100 Å hole injection layer of Compound A, a 100 Å hole blocking layer (“BL”) of different materials depending on the specific device, a 400 Å electron transport layer, and an LiF/Al cathode. The emissive layer included a first organic layer and a second organic layer with an interface between them, where the first organic layer was 300 Å of a non-emissive material (the “host” in Table 9) at a concentration of 70 wt % and a phosphorescent material (the “dopant” of Table 9) at a concentration of 30 wt %, and the second organic layer was 300 Å of the same non-emissive material (the “host” in Table 9) but at a concentration of 90 wt % and the same phosphorescent material (the “dopant” of Table 9) but at a concentration of 10 wt %. The specific host and dopant for each device are identified in Table 9. Thus, the general device structure for the devices of Table 9 was: ITO (1200 Å)/Compound A (100 Å)/host (70 wt %):dopant (30 wt %) (300 Å)/host (90 wt %):dopant (10 wt %) (300 Å)/BL (100 Å)/Alq3 (400 Å)/LiF/Al. wherein all organic layers between the first organic layer and the anode do not include any materials containing a group selected from the group consisting of triarylamine, napthyl, tri(N-carbazoyl)triphenylamine, tetraarylamine and carbazole. 2. The device of claim 1, wherein there are no organic layers between the first organic layer and the anode. 3. The device of claim 1, further comprising a third organic layer disposed between the first organic layer and the anode. the third organic layer is in direct contact with the first organic layer and the anode. 5. The device of claim 3, wherein all organic layers between the first organic layer and the anode consist essentially of organometallic materials. the first non-emissive material and the second non-emissive material are the same material. the first non-emissive material and the second non-emissive material are different materials. the first organic layer, the second organic layer, or both, further comprise a lower energy emissive material, wherein the concentration of the lower energy emissive material is 0.1-12 wt %. 11. The device of claim 3, wherein the first organic layer consists essentially of the first phosphorescent material and the first non-emissive material, and the second organic layer consists essentially of the second phosphorescent material and the second non-emissive material of the first organic layer. 12. The device of claim 3, wherein the device includes no more than three different organic materials. 13. The device of claim 3, wherein the device includes no more than four different organic materials, and one of the organic materials is an electron transport material present in the device only between the emissive layer and the cathode. 14. The device of claim 3, further comprising a fourth organic layer disposed between the second organic layer and the cathode, wherein the fourth organic layer consists essentially of materials having a triplet energy at least 0.1 eV greater than the triplet energy of the second phosphorescent material; and wherein the fourth organic layer is in direct contact with the second organic layer. 15. The device of claim 3, wherein the first non-emissive material is selected from materials containing a group selected from the group consisting of triphenylene, carbazole, dibenzothiophene and dibenzothiophene coupled with carbazole. 16. The device of claim 3, wherein the concentration of the second phosphorescent material in the second organic layer is at least 5 wt % lower than the concentration of the first phosphorescent material in the first organic layer. 17. The device of claim 3, wherein the concentration of the second phosphorescent material in the second organic layer is at least 10 wt % lower than the concentration of the first phosphorescent material in the first organic layer. 18. The device of claim 3, wherein the total thickness of the first and second organic layers is at least 400 Å, and wherein the thickness of the first organic layer is at least 50 Å and the thickness of the second organic layer is at least 50 Å. 19. The device of claim 3, wherein the first phosphorescent material has a highest occupied molecular orbital that is at least 0.3 eV higher than the highest occupied molecular orbital of the first non-emissive material, and the second phosphorescent material has a highest occupied molecular orbital that is at least 0.3 eV higher than the second occupied molecular orbital of the first non-emissive material. 20. The device of claim 3, wherein all organic layers between the first organic layer and the anode have a hole mobility and an electron mobility such that the hole mobility is at least twice as great as the electron mobility. 21. The device of claim 20, wherein all organic layers between the first organic layer and the anode have a hole mobility and an electron mobility such that the hole mobility is at least ten times greater than the electron mobility. 22. The device of claim 20, wherein all organic layers between the first organic layer and the anode have a hole mobility and an electron mobility such that the hole mobility is at least one hundred times greater than the electron mobility. 23. The device of claim 3, wherein all organic layers between the first organic layer and the anode have a hole conductivity sufficiently large such that an additional 10 nm thickness in the layer results in a voltage rise of 0.1 V or less at a current of 10 mA/cm2.